A contractor's affidavit is a statement of payment due, but it is also a legal document necessary for the filing of a lien against the property if they are not paid. Because it functions as both, and because the contractor cannot seek a lien without one, states require certain information in the affidavit. This can vary from state to state, making contractor's affidavit a complex issue within construction and contract law. Contractors work under contract, which means that they receive payments at different stages of the job, and may not receive the bulk of the payment until the job is finished. As they work, they may have to pay for materials and subcontracting work, and they do so relying on the contract they've entered into to insure that they will be paid. 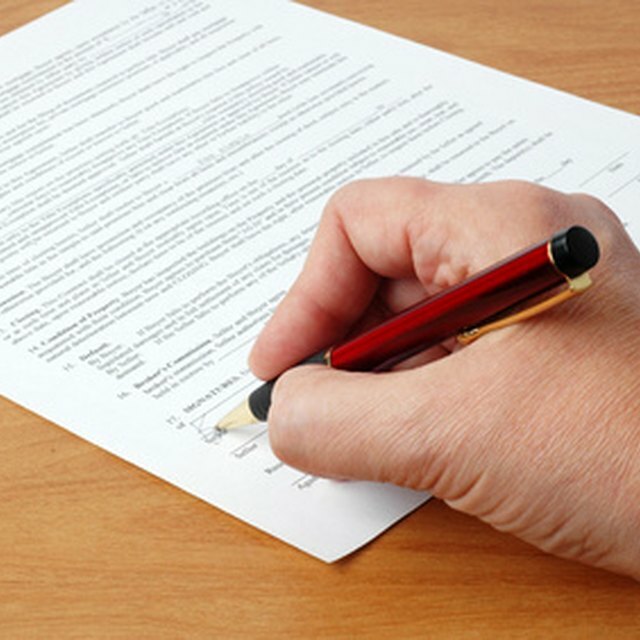 A contractor's affidavit is a statement of how much is due and for what reasons. If the building owner doesn't pay them, the contractor has the right to file a lien against the property. To do that, the contractor's affidavit must comply with state law and statutes. Noncompliance can mean that the contractor loses their right to file a lien. The affidavit must follow a set form and present set information, and the contractor must present it to the building owner within a set amount of time; however, each state has different statutes. There are some generalities of what an affidavit should include. Generally, the contractor or their agent -- who must have personal knowledge of the facts -- must sign and swear to the affidavit, and they must have it notarized. It must contain a list of the contractor's expenses, notes as to which ones the contractor has paid and which are still outstanding, and for what amounts. In addition to the different procedures required by state law, there are also different procedures depending on whether the contractor had a direct contract with the builder or owner, or if they were working as a subcontractor, laborer or material provider. These subcontractors may also have a right to a lien against the property, although it depends on the type of the contract, the amount, and the individual statutes of the state in which they're working. If the contractor is hired for work on public works, they can also issue an affidavit as a demand for release of withheld funds.